On Dec. 10, dignitaries from around the world made a pilgrimage to Johannesburg to pay respects to Nelson Mandela, who died five days earlier at the age of 95. Obama chose to neglect the fact that for years the government that he represents in Washington had collaborated with South Africa’s apartheid regime in acts of repression against Mandela, his African National Congress (ANC), and other Black liberation organizations. The CIA gave information to South African authorities in 1962 that helped them to capture Mandela and send him to prison for over 27 years. And Mandela remained on the U.S. “terrorist” watch list until 2008. People around the world revere Nelson Mandela for his courage and quiet wisdom. And they revere him, as they do Martin Luther King, for his dream of “a democratic and free society in which all persons live together in harmony and with equal opportunities.” But the element of Mandela’s character that Obama and other imperialist leaders—and the compliant big-business media—have chosen to highlight is his so-called ability to forgive the oppressors of South Africa’s Black population. That quality is the one that they call on the youth of Africa to emulate. Unfortunately, history shows that Mandela and the ANC went beyond mere moral “forgiveness” toward the oppressors, and instead fell into the trap of offering them deep political and social concessions—an escalating process that ultimately betrayed apartheid’s victims. The shell of apartheid was dismantled, but the core of the exploitive social system was allowed to remain. South Africa today displays one of the steepest divisions between wealth and poverty in the world. Since the ANC first formed the government, almost 20 years ago, the number of people living in poverty has risen. While the number of millionaires in the country has doubled in that period, so has the number of people earning less than a dollar a day. The average white family earns six times what Black families earn. Joblessness has also risen. According to Goldman Sachs, as many as 35 percent are unemployed, when people who have given up looking for work are factored in. This rises to 70 percent among Black youth. Millions live in shacks—often without electricity, sanitation, or water—and generally in segregated townships in which Black people continue to be further subdivided by apartheid-era racial categories (African, coloured, Indian). And at the same time, even some shack cities have been wantonly demolished by ANC governmental authorities, leaving the inhabitants homeless. This has spurred a new movement of people protesting in the streets with banners that cry, “Give us back our land!” as in the days of apartheid. Meanwhile, a layer of billionaire capitalists, residing in suburban mansions behind locked gates, scoop up the lion’s share of the country’s mining and industrial wealth in private profits. Most of these super-rich, as during apartheid, are white—with a handful of Black capitalists newly added to their number. Mandela, South Africa’s first Black president, had the authority and prestige to mobilize the country in a true emergency campaign to eliminate poverty. This could have been accomplished by carrying out revolutionary measures aimed at completely transforming the capitalist social system, and remaking it in the interests of working people and the poor. Instead, he and his comrades in the African National Congress settled for accommodations with big capital, in vain hopes that the proceeds of capitalist growth would trickle down to the masses. As University of Capetown Professor Robert Schrire put it (as cited in Bloomberg Businessweek): Nelson Mandela “recognized that for the poor to prosper, the rich had to feel they had a future in this country.” And true to design, the rich were greatly mollified, as giant multinational corporations swept into the country—often to gobble up weaker South African enterprises. But the poor benefited only minimally, and the unemployment checks that many workers received from the state hardly made up for the jobs they had lost. Mandela played the central role in formulating the initial agreements between the liberation movement and the apartheid regime. At first, talks were carried out in secret—even when Mandela was still in prison. Later, the process was formalized in the CODESA (Convention for a Democratic South Africa) conferences of 1991-92. Joe Slovo of the South African Communist Party is credited at CODESA with offering the key compromise of a “sunset clause,” which guaranteed that a white-Black coalition capitalist government would remain in power for at least five years. 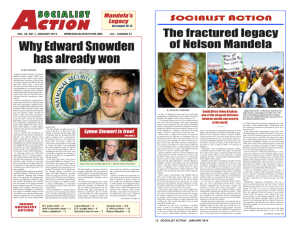 In the midst of these negotiations, in June 1992, I visited South Africa as a reporter for Socialist Action newspaper. The ANC had been legalized two years earlier, and its national offices now filled the skyscraper office building in Johannesburg that had once served the Shell Oil corporation. It appeared evident to me that the leaders of the ANC whom I met, and their legions of clerks and secretaries, no longer saw themselves as part of a popular liberation movement but instead had their eyes on portfolios in the upcoming coalition government. I wrote at the time: “With the establishment of a transitional government, the [F.W.] de Klerk regime expects to give up very little in return for what it will gain. South Africa’s rulers hope to take their place once again as full members of the capitalist ‘family of nations,’ with full international trading rights. They also hope for a relatively placid domestic situation, with non-political American-style trade unions and a toothless opposition willing to participate in a parliamentary debating society. In any case, the Mass Action campaign did not last long; soon ANC and union leaders sought to cool things down by offering even more concessions. A year later, when former ANC guerrilla leader and current head of the Communist Party Chris Hani was murdered, Nelson Mandela intervened to stem angry protests; in his address to the nation on the issue, he said that the current crisis demanded that national elections not be put off any further. In 1994, the African National Congress received a majority vote in the new National Assembly. Nelson Mandela formed a “national unity government,” giving former apartheid head of state de Klerk the post of second deputy vice president. From that time, a series of neoliberal reform programs ensued that bowed deeper and deeper to the demands of big corporate interests. In a guarantee to the international banks, for example, Mandela and his government agreed to continue paying the “apartheid debt,” which was owed for items that included military supplies and prisons that the previous white government had used to repress the Black masses. Andrew Ross Sorkin, business columnist for The New York Times, provided details (Dec. 9, 2013) of how Mandela was persuaded to forsake the vague calls of the ANC’s founding document, the Freedom Charter, to nationalize the mines, banks, and monopoly industries—and to instead choose the path of unfettered capitalism. “The story of Mr. Mandela’s evolving economic view is eye-opening: It happened in January 1992 during a trip to Davos, Switzerland, for the annual meeting of the World Economic Forum. Mr. Mandela was persuaded to support an economic framework for South Africa based on capitalism and globalization after a series of conversations with other world leaders. Ronnie Kasrils, former intelligence minister in the ANC government and a long-time member of the Communist Party, told “Democracy Now!” that once Mandela had made up his mind on the rapprochement with big business, he remained firm with it, and was instrumental in convincing the “left wing” of the ANC—which Kasrils identified with the Communist Party—to go along. “There was no real debate or argument about this,” said Kasrils. But that should be no surprise. The South African Communist Party, trained by the representatives of Joseph Stalin, had long been urging the liberation movement to restrain its activity and limit its demands, under the misapprehension that working-class rule and socialism would not be “on the table” for many decades. Kasrils justified Mandela’s pro-capitalist policies to Democracy Now! listeners by expressing the view that he had no other alternative under the extreme conditions of the day, with attacks from what was called the “third force” (undercover police, Afrikaner white nationalists, Inkatha, etc. ): “We could have had a civil war at the time. There could have been enormous bloodshed!” Kasrils, like Mandela and the ANC, had no confidence that mass mobilizations could effectively counter the “third force” death squads. But lasting success in such a campaign would have required leadership and a program that could rally the oppressed masses in an unstoppable movement for social liberation and working-class political power. Today, the ANC reeks with cronyism and corruption. The selfish mentality of many in the organization’s top leadership is symbolized by Cyril Ramaphosa, deputy president of the ANC and former leader of the National Union of Mineworkers, who has become a multi-billionaire capitalist, with investments in platinum mining. To their shame, Ramaphosa and the current ANC leadership abetted and then tried to cover up the horrible police massacre of protesting platinum miners at Marikana in 2012. At the Dec. 10 memorial rally for Nelson Mandela in Johannesburg, the crowd booed each time that the image of South African President Jacob Zuma appeared on the big screen. It was left to his deputy, billionaire Ramaphosa, to attempt to hush them, exclaiming, “We should show the same level of discipline as Madiba [Mandela] exuded!” It is an ugly fact, however, that part of Mandela’s legacy is Zuma, Ramaphosa, and their like—former radical activists who have now grown fat and cynical. December 13, 2013 in Africa, Black Liberation, International.